Auckland celebrates its LGBTIQ (lesbian, gay, bisexual, transgender, intersex, queer) communities during the Pride Festival in February. Pride Festival has become an important part of the Auckland Libraries’ calendar, with a number of events such as pop-up libraries and storytimes programmed over the course of the month (including at the same same but different festival). However, as recently as the early 1980s not only was it legal to discriminate against a person on the basis of their (declared or suspected) sexual orientation, certain ‘homosexual behaviour’ was criminalised. At the time that Wellington Central MP Fran Wilde introduced the Homosexual Law Reform Bill in 1985, there was fierce debate both among politicians and throughout society about what the passing of such a bill might mean for New Zealand. In the Sir George Grey Special Collections reading room, Central City Library, the Homosexual Law Reform clippings scrapbook will be on display during February. This scrapbook, compiled by librarians at Auckland Public Library in 1985-1986, describes a timeline of the bill’s progress as reported in major New Zealand newspapers and magazines such as the New Zealand Herald, the Auckland Star and the Listener. 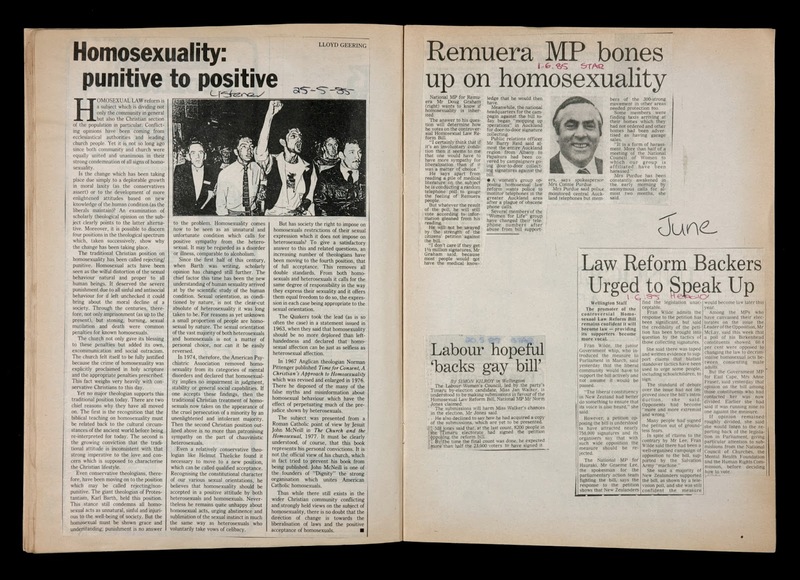 Ref: [The Homosexual Law Reform Bill: scrapbook of newspaper cuttings], 1985-86, Sir George Grey Special Collections, Auckland Libraries, 345.02536 H76. A variety of perspectives are evident in these clippings. There were those vehemently opposed, including the MPs who saw the bill as a threat to family values and gathered signatories for a petition against it. A wide variety of opinions are expressed by Christian commentators, some of whom supported the bill but did not condone homosexuality. There are also the forthright opinions of those backing the bill. Many supporters saw it as a human rights issue, aligned with international trends in eradicating discrimination. Some supporters were also concerned that HIV/AIDS was increasingly affecting many individuals in the gay community, but that fewer people were likely to seek diagnosis and treatment if doing so meant revealing themselves as ‘criminals’. This original scrapbook will be on display in the reading room during February. Access copies have been created and are available for viewing in the reading room as well as in the Central Research Centre. Our heritage collections aim to provide a diverse and inclusive range of materials on LGBTIQ people and communities and we welcome donations that help this goal.